How did Maine Coast become a pioneer in employee health benefits? We believe in doing what it takes to keep our employees healthy and working safely. York, Maine Maine Coast, a world-wide distributor of North American lobster, and Independent Health Advantage, a Direct Primary Care (DPC) medical practice, both companies headquartered in York, Maine, have created the first partnership in the State to integrate Direct Primary Care into an employer – sponsored benefits package. Maine Coast, having undergone significant growth over the past two years, was awarded a place on Inc. 5000’s Fastest Growing Private Companies in America list for 2017 (#2749 in America, #10 in Maine). 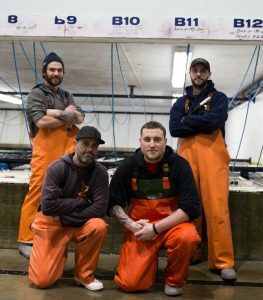 With a growth rate of 125% over the past three years and the co mpany’s expansion into a 5000 square – foot live lobster warehouse at the Boston Fish Pier in July 2016, Maine Coast founder Tom Adams felt a responsibility to improve upon the health care he has been giving his dedicated employees. For this benefit to be affordable to employees and management, Adams collaborated with Independent Health Advantage, a Direct Primary Care practice. “From the employees’ cost perspective, this is a great benefit. There are no co-pays involved. Furthermore, employees will now avoid having to work toward meeting their high deductible; for which many will never hit. This relieves our team members of the burden of paying significant out-of-pocket healthcare expenses. Instead, they get to develop a personal meaningful relationship with their doctor.” Adams feels that this benefit will also help with employee retention , while it builds a supportive corporate culture that fosters employee engagement, safety and wellness, and job satisfaction. “By adding Direct Primary Care to our employee benefits package, we are working toward creating a unique company culture at Maine Coast – and increased employee health is part of that culture. This enhanced benefits package will help attract and retain valuable team members and pr oduce healthier, more productive employees, which ultimately affects my bottom line,” states Adams. George Claassen, expert on Employer/DPC partnerships and Innovative Employee Benefits Solutions consultant for Borislow Insurance based in Methuen, MA, sees such arrangements gaining momentum as small-to medium-sized businesses struggle to retain quality employees and cover the cost of employee health benefits. Claassen explains Direct Primary Care provides business owners an alternative to the frightening cost of employee health benefits. Dr. Peter Sacchetti, physicia n and founder of Independent Health Advantage has bee n in practice in York County for over 10 years prior to opening Maine’s first Direct Primary Care Internal Medicine practice two years ago. He saw a unique opportunity to bring an affordable employee healthcare option to business owners here in Maine and N ew Hampshire. “In general, a company can proactively protect its claim s pool by integrating DPC into their employee benefits. As a supplement to its partially self-funded healthcare plan the company and employee have the advantage of knowing the real cost of its medical expenses , versus one that chooses fully-funded health insurance – where costs remain unknown. By selecting a partially self-funded plan, some employers, like Maine Coast, stand to save thousands each year over a fully-funded plan,” explains Dr. Sacchetti. In Dr. Sacchetti’s practice, Maine Coast patients will have 24/ 7 access to his direct cell phone, email and tele-medicine capabilities, and same-or next-day unrushed appointments. An on-site laboratory provides point-of-care results and the private pharmacy offers patients the option to purchase prescription med ication at near – wholesale prices . Pre-employment physicals and timely evaluations of work – related injuries eliminates the reliance of outsourcing these services, further reducing the business cost .